N/Aris and sediment can be cleaned from retention and equalization basins, holding tanks, and storage chambers using an SFT sediment flush tank. This unit is filled with water to a specific level, then becomes unstable and tips over. 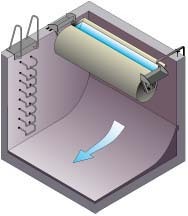 The rush of water produces a high amplitude wave, which moves the debris from the floor to the sump at the end of the flushway, cleaning out the system. The tank is made of corrosion-resistant stainless steel, and requires no auxiliary energy to operate. , 6290 Périnault, Montréal, Quebec H4K 1K5. Tel: 514-334-7230; Fax: 514-334-5070.